Alan Wilson proved on Saturday night that there is no such thing as underestimating a home track advantage at Oxford. 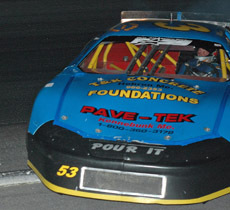 The driver of the #53 car is a rookie on the PASS tour, but a veteran of racing at the 3/8th mile Oxford oval. In fact, he’s been racing for close to 30 years and was the 1979 Limited Sportmen and 1984 and 1989 Charger champion. He has 50 career victories at the track. Wilson sure looked like he knew how to get around the track Saturday night. He scored a dominating victory in the second 50-lap segment of the night. He got caught in a multiple car incident early in the third segment and spun off the lead lap. He made his lap up under green and went on to finish second overall under the Triple 50 format. And what about that home track advantage? Wilson almost scored an upset victory last year in the biggest event of the season at Oxford, the Banknorth 250. Wilson led late in the going for 63 laps in that race before sliding off the backstretch and finishing fifth. This season, he has something to prove in the classic summer event. Another driver with plenty of laps around the Oxford Plains Speedway is Busch North legend Kelly Moore. Moore entered Saturday night’s PASS event with the hopes of having a little bit of fun returning to his roots. That didn’t happen with his 18th-place finish. The performance from this past weekend leaves a question mark as to whether Moore will be back for July’s Banknorth Oxford 250, but if he’s not entered for that race, it’s likely that his son Ryan will be. Benjamin isn’t taking his misfortune in stride any longer. The perfect setting for Benjamin to have his luck turn around could be at Unity Raceway this weekend. It’s where Benjamin cut his teeth in racing and still competes weekly in the midweek Modified division. Sophomore PASS driver Corey Williams stepped up his game for all to see at Oxford. He had a leaky value cover gasket in his heat race and DNF’ed. But came back to run seventh in the first 50 lapper. Field inversion put him to the back of the next segment and just two laps into that run, he got spun entering turn three after contact from Kelly Moore. Being able to race with some of the top names in the series was something that Williams felt right at home doing. When points were tallied, Ben Rowe finished third overall. He was a little surprised to find that fact out. Like Ryan Moore, Cassius Clark grew up watching his father race in the NASCAR Busch North Series. Billy Clark, known as the “Farmington Flyer”, was also quite a shoe at Oxford with twenty career victories there. Even the car owner of Clark’s #8 car, Ed Chapman, has four victories at Oxford to his credit. Meanwhile, Cassius had only won there once in a Legends car. After practicing at Oxford for the rained out April PASS event, he didn’t think that he was going to get much of a chance at #2 anytime soon, but he was wrong. Williams completed act two in the 30th position, but he didn’t let that get him down. He promptly started up front in segment three, led the most laps of that portion of the show and settled in to finish third behind Cassius Clark and Ben Rowe. Clark remembers watching his dad at Oxford. Now Clark has some catching up to do with 18 more victories at Oxford needed to tie his father. No race would be better to count towards that for Clark than the upcoming 250. “We’re ready for the big one now,” said a smiling Clark in victory lane. Two things have been pretty consistent through Travis Benjamin’s 2005 racing season. First, he has been in the position for a trop finish just about anywhere that he goes. Second though is the fact that somewhere between that finish lies a mountain of bad luck. This week at Oxford, Benjamin finished segment one in the fifth position, completed segment two in seventh after a field inversion and then picked up hitchhiking money who jumped on his back in the final 50 lapper. This time, the #17 car got stuck in the middle of a multi-car wreck not of Benjamin’s doing. 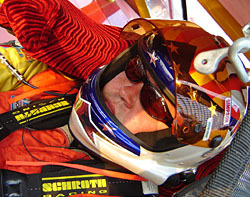 Scott Chubbuck nursed his car to a top five finish. He stayed out of trouble to collect a 10th, 11th and sixth in the three 50 lappers and although he didn’t make any headlines in the race, he was right there in fifth when all was said and done. The triple 50 format worked out pretty well for the Chubbuck and his Cushman Engineering team. And splitting racecars on a tight track was a recipe for disaster. The killed the strategy that the #17 team had planned for the end of the race.